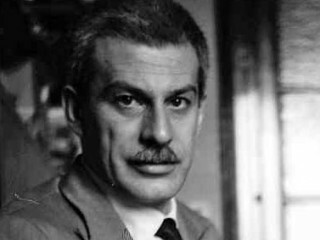 The Italian novelist, translator, editor, and journalist Elio Vittorini helped to prepare the ground for the Italian neorealist movement. Elio Vittorini was born on July 23, 1908, at Siracusa, Sicily, the son of a railroad employee. His formal education was scant and rudimentary; after a few years at a technical school he left Sicily at the age of 17 and worked at road construction near Udine in northern Italy. In the late 1920s he quit road work and moved to Florence, where he settled with his wife, Salvatore Quasimodo's sister. There he held a job as proofreader for the daily La Nazione and for some time was editor of the review Solaria. During this time he began writing short stories, which appeared in Solaria. He learned English from an old printer, who had been abroad, and began translating American fiction; then he was forced to leave the paper, suffering from lead poisoning. While writing Conversazione in Sicilia, which he finished in the winter of 1939, Vittorini moved to Milan. After a first edition in 1941, the book was attacked, then withdrawn. In 1943 he was jailed for a time for political reasons. He joined the Communist party but withdrew again after a public debate in the late 1940s, and in the 1958 elections he was the Radical candidate in Milan. From 1945 to 1947 he edited the Marxist review Il Politecnico. Later he edited the review Il Menabo‧ together with Italo Calvino. The death of his son Giusto in 1955 caused Vittorini to interrupt for some time, his work on his last novel, Le citta‧ del mondo. It remained unfinished when he died on Feb. 14, 1966, in Milan. Most of Vittorini's works are autobiographical in one sense or another. Through his use of narration by implication and a fuguelike technique, he exerted a considerable influence on the postwar generation of Italian writers. Most of the stories contained in Piccola borghesia (1931) had been published in Solaria. Viaggio in Sardegna (1936) is only seemingly a travel book, a report of a trip to Sardinia. In a deeper sense the trip is seen as a "return to the fountains," a retrieval of the golden age of childhood in Sicily, the primeval state of human existence. Vittorini's first novel, Il garofano rosso (1948), was begun about the same time as Viaggio in Sardegna, toward the end of 1932, and published in installments in Solaria. Vittorini was later dissatisfied with this perfect specimen of a bourgeois psychological novel and rejected the approach he had used. Conversazione in Sicilia (1941), Vittorini's major work, had a considerable impact upon the younger generation of writers. Built around key images, the novel on the surface is the story of a young Linotype operator's brief visit to his birthplace, Siracusa, in Sicily. The underlying theme, however, is the spiritual experience of rediscovering the genuine sense of life of his youth and thus regaining the lost meaning of his existence. Uomini e no (1945) is Vittorini's contribution to the genre of the Resistance novel. Il Sempione strizza l'occhio al Frejus (1947) is a short novel about a worker's family in a suburb of Milan with hardly a plot. Le donne di Messina (1949), Vittorini's most involved novel—there exist several versions—deals with the conflict between individualism and socialism. La Garibaldina (1950), Vittorini's last piece of fiction, is in a way similar to Conversazione in Sicilia as it recasts the "return to the fountains" in almost identical fashion. With the fragment of a novel, Le citta‧ del mondo (1969), Vittorini returned again to Sicily. Diario in pubblico (1957) is a selective collection of Vittorini's critical writing. Most of the writing on Vittorini is in Italian. In English, an excellent study of his works appears in Donald N. Heiney, Three Italian Novelists: Moravia, Pavese, Vittorini (1968). Recommended for general historical background is Sergio Pacifici, A Guide to Contemporary Italian Literature (1962). View the full website biography of Elio Vittorini.